We’ve been keeping track of every single Spotify-related website, app, tool and resource for a while now: the count is nearly at 200! There may have been a bit of a slowdown in new sites this year compared to last, but there’s still been an average of around one new community site coming online every week. Here we pick our five-of-the-best from 2011 so far: each offers something new and different and demonstrate the unique depth and passion in the Spotify community. 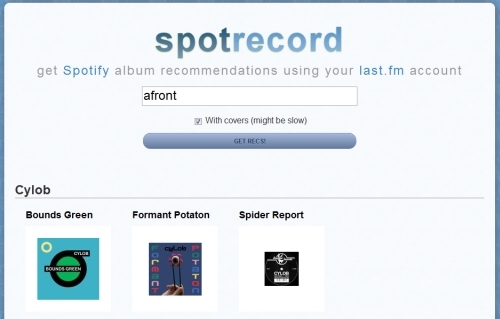 spotrecord uses your Last.fm profile to make album recommendations. It doesn’t just list artist you’ve already listened to or new releases though: instead, spotrecord uses Last.fm’s Similar Artists section to offer a selection of albums from artists you haven’t heard but might like. The albums are grouped by artist and include nice big album covers to click on. It returns a selection of albums from four artists at a time: just click the “Gimme More” button at the bottom for another selection. There are several sites that provide Spotify links to the day’s most-tweeted albums and artists (for example, FY Spotify), but Viral Music List does this for Facebook. Whenever someone shares a Spotify link on Facebook, Viral Music List gathers this data and updates its charts once a day. The site shows the Top 20 Viral Tracks, Albums and Artists with options to view charts for the day, the week, or all time. You can click on the links to drill-down for detail (for example, click an artist’s name to see how “viral” each of their albums is, then click again for a track-by-track breakdown). There are also auto-updating Spotify playlists of top weekly tracks or artists that you can subscribe to. 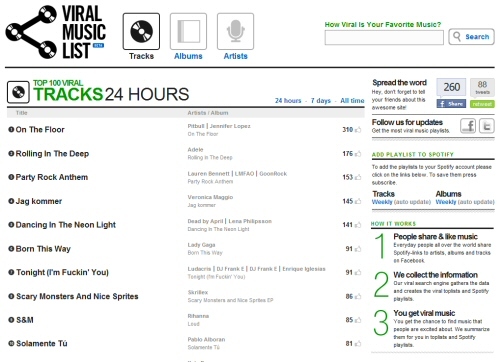 A search box lets you find out “How Viral Is Your Favorite Music,” although you may find less-mainstream bands not listed. Spotify.fm is another site that mashes together the power of Last.fm’s APIs with Spotify’s vast catalog of music. Dubbed “an experiment in musical serendipity,” Spotify.fm lets you listen to what your friends on Last.fm are listening to in real-time. 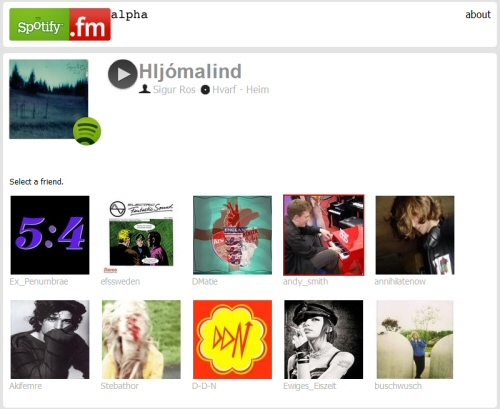 After entering your Last.fm user name, the site scans your friend list to see who’s currently listening to music. You can then pick a friend and listen along to the same songs in Spotify. As your friend plays different tracks, your own Spotify player follows along (the site refreshs at the end of each song). Since track timing is critical, if you’re on Spotify Free you may find that the audio ads throw things out of sync. Apart from that though, this is a very clever mashup that gives a nice “live” feel to to the Spotify experience. Essential for every discerning audio-stalker! The Heavy Metal Encyclopedia is an essential Spotify-friendly website for all you headbangers out there. Its massive metal archive lists more than 60,000 bands, 180,000 albums, and almost 100 heavy metal subgenres. 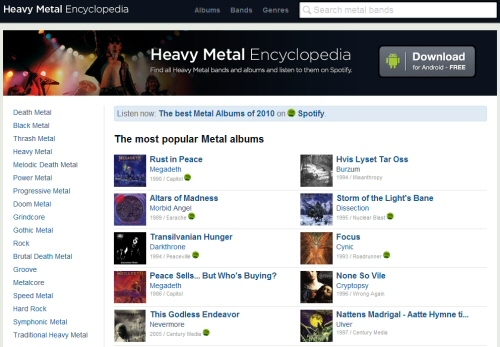 The front page shows the most popular metal albums, all with Spotify links (where available). Clicking the Albums tab shows you the top-rated metal albums, which you can then filter by release year. The Bands tab shows the most-popular metal bands (again with Spotify links – just nobody say Metallica!) and Genres tab lists subgenres ranging from Death Metal, Thrash and Speed Metal through to Industrial, Grunge, and, er, Flamenco. The Heavy Metal Encyclopedia is also available as a free Android app, which works seamlessly with Spotify. This is a fantastic site and app with a clear design, deep catalog, and obvious musical passion throughout. I only wish someone would do something similar for electronic music! 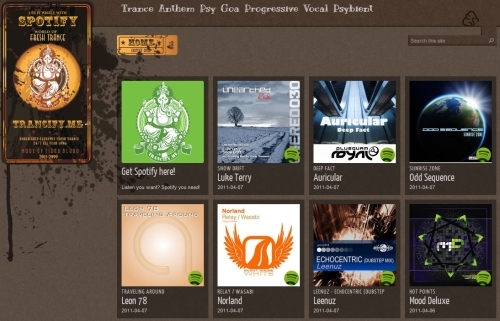 Trancify is like a customized version of our own New on Spotify page. Specializing in new trance music releases on Spotify, Trancify (which is “made of tiger blood“) checks for new releases in Spotify on a daily basis, then cross-checks with Last.fm to determine a subgenre. Current genres represented are trance, anthem, psychedelic, goa, progressive, vocal and psybient, so expect to find releases from the likes of Tiësto, Armin van Buuren, Eat Static, Atmos, Infected Mushroom and Shpongle (to name but a few). Click a genre to see relevant new releases, with clicks to listen on Spotify. I’m a big fan of this style of music (especially psytrance, progressive trance and psybient) so for me this site is an especially welcome addition to the Spotify community. For a complete list of all Spotify-related Sites & apps, check out our Spotify Resources page!